Preparations for departure went quickly this morning. All luggage, ice chests, and lawn chairs had to be loaded into the vehicles before we checked out of the Western Hills Guest Ranch. 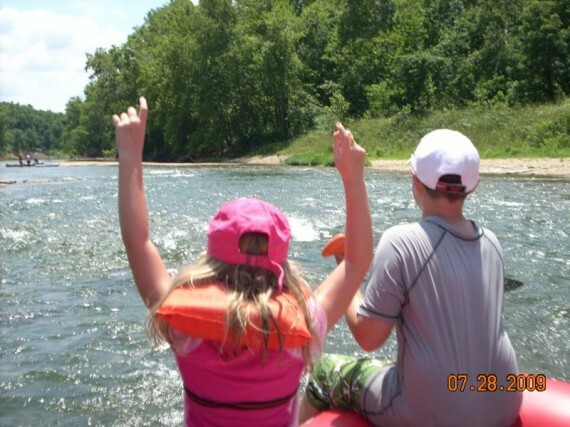 Our agenda includes floating the Illinois River today – something the kids have never done, and it has been over 10 years since the last visit for PK & KK, and for Stephanie and me. 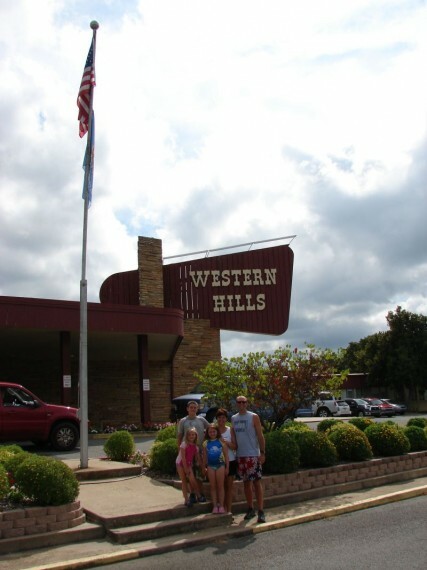 The pool and common areas at the Western Hills Guest Ranch. Awesome!! Traveling Kings in front of the retro Western Hills sign near the lobby. 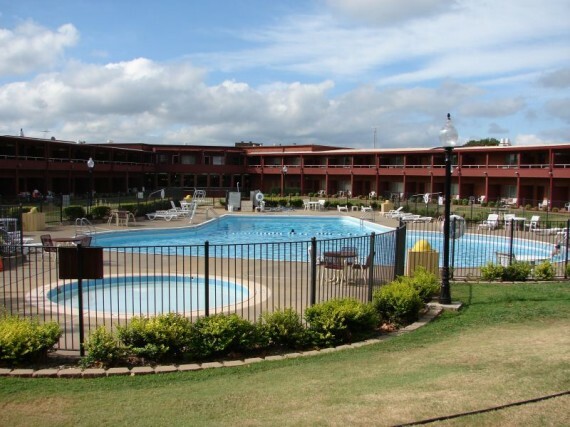 We took our now-familiar route from Sequoyah State Park over to Tahlequah, and stopped at a convenience store just a few miles from the river. We stocked up on ice and refreshments, and hit the road. 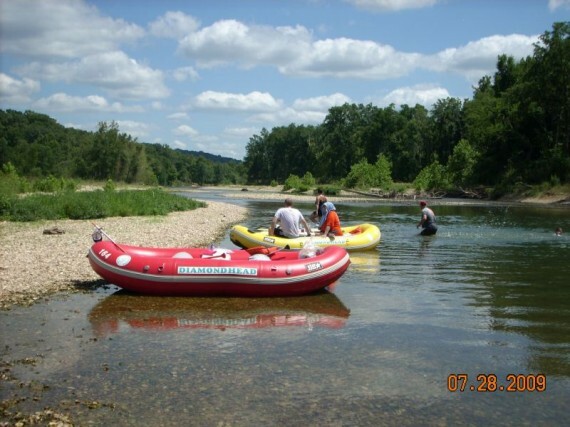 There are maybe a dozen float trip operations on the Illinois River. I had heard good things about Diamondhead Float Trips, so we used them. Most all of the operations offer rafts, canoes and kayaks. We paid for two six-man rafts, which was perfect for the eight of us and our two ice chests. We were picked up in the parking lot by a short school bus, hauling a trailer containing the boats. The bus picked up our group of 8, as well as two other families. We opened up the back door of the bus to put our ice chests inside, and had to move the pile of life jackets blocking the door. We loaded onto the bus, taking care not to twist an ankle on the oars which littered the floor, going this way and that. The bus was crowded and dusty, and we were thankful we came on a pleasant day. All the windows were down, and even though we were sitting as many as 3 to a seat, we were comfortable. Diamondhead offers a six mile float trip and a twelve mile float trip, and we chose the six mile, along with everybody else on the bus. We were told this would last about 4 hours, depending on how many stops you make. We pushed off from shore at 12:30. We could not have asked for a more perfect day. The morning had brought some heavier cloud cover and there were whispers of concern in our group, but by afternoon, we had temps in the 80s, blue skies and white puffy clouds. The energy and excitement level of our group was high! Preparing for departure on the float trip. A raft is so much better than a canoe! 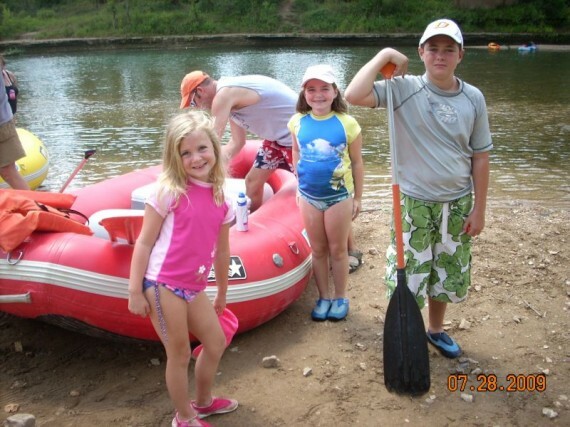 Mallory rode in a raft with KK, PK and Scott, while the rest of us occupied the second raft. The group in the other raft immediately took off paddling, as though we were going to be fined for taking more than 4 hours on the trip! Actually, we spent most of the day a comfortable distance behind them, as they seemed much more interested in rowing their boat than we did. Marissa and Miles lead the way on our raft. 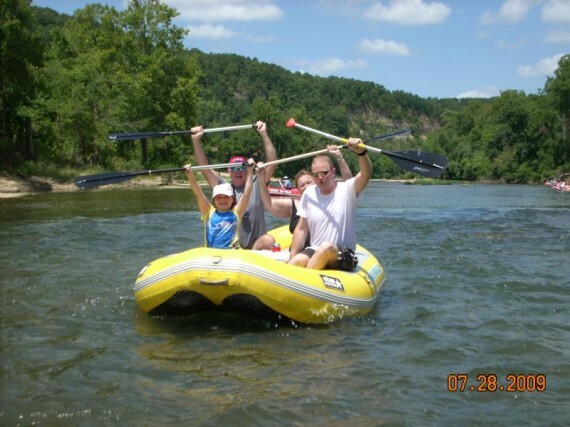 KK, PK, Scott and Mallory braving the rapids on the Illinois River! Our first stop was about a half hour into the trip. Mallory noticed a rope swing that hung out over the river, and she wanted to stop. After we had all pulled onto the “beach”, we decided it was time for lunch, so we took a break. We ate sandwiches and potato chips down the beach from a larger group of about 20 that was also taking a rest stop. We beached our rafts and took a lunch break. 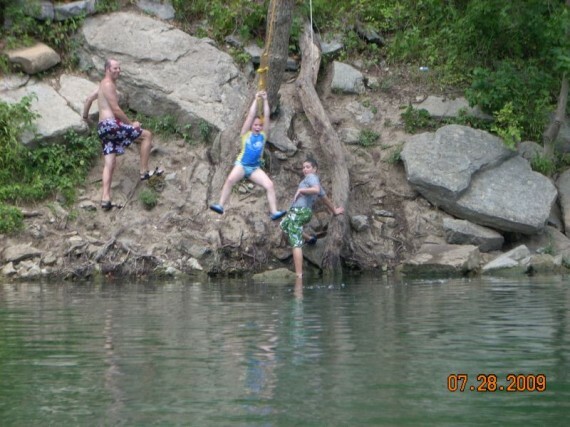 After lunch, Mallory, Miles and I swam to the other side of the river and started negotiating the rope swing. The rope had broken, and had new strips of rope tied to it, over time. The length of rope was such that I had to grab the rope and pull it back to the side so that either one of them could reach it. We all took turns jumping off the rope. A word of advice to would-be jumpers: don’t hang onto the wooden picket which is tied to the rope – hang onto the loop in the rope. Both Miles and I hung onto the picket once, and it tore us up! Mallory jumping off the rope swing, into the Illinois River. The depth of the river varied in certain sections, but generally there was plenty of water for us to float. We only had to get out and drag our raft one time, as I recall. The water was pristine. We were able to see hundreds of fish, both large and small, during our trip. We liked to joke throughout the day that it is amazing how clear the water was, considering that Arkansas likes to dump their chicken poop into the river upstream! The rest of the journey on the river was very low-impact. We would exchange pleasantries with other floaters as they passed by. There was plenty of sunshine, and plenty of shade. 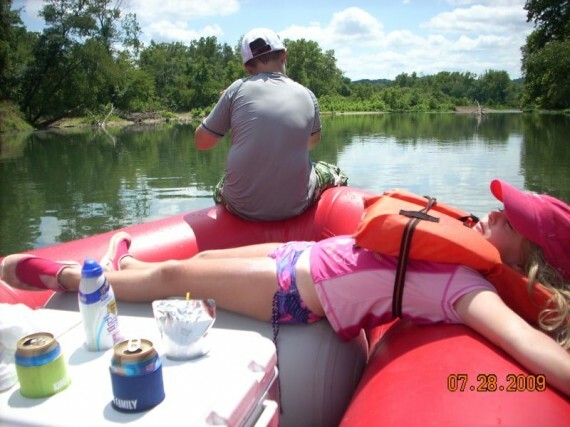 Marissa, our six year old, would stretch out on the raft and sun herself, as though she were a teen-ager. We pulled over to the side numerous times to stretch our legs, and lengthen our amount of time on the river. 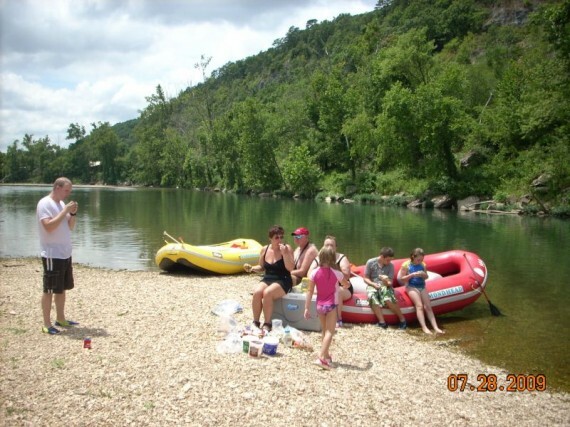 At one point during our journey, we noticed an extraordinary amount of beer cans in the river, so quite a few of us got out of the rafts and started picking them up, placing them in our trash bags we brought along. Overall, the cleanliness of the river was very good. We all felt there was minimal trash. Marissa is practicing being a sun goddess on our raft. Late in the day, our situation has deteriorated. Some members of the party have resorted to wearing shorts on their head! Much to our chagrin, as we rounded a turn, we saw the exit for the Diamondhead floaters. We quickly pulled over onto a beach about 50 feet before the pickup point, and had one last soak in the river. We finished the 6 mile journey in about 3 ½ hours! We obviously did not take enough rest breaks along the way. Diamondhead offers shower facilities and bathrooms right there at the exit point, which is also where our vehicles were parked. KK, PK and Scott all took a quick shower and changed into some fresh clothes. Scott had to head back to his hometown, so we said our goodbyes to him. KK offered to take the rest of us out to dinner in Locust Grove, and we all thought that sounded like a great idea. We drove up Highway 10, along the Illinois River, until we reached the Cherokee Turnpike. At this point, we were less than 15 miles from Arkansas, and then we started heading west toward Locust Grove. We enjoyed the pizza buffet at Mazzio’s, which is right off the turnpike. There was not a great deal of conversation during dinner, as everybody was pretty tired from our day in the sun. Everybody got stuffed full of salad, pizza, and cinnamon sticks, and then we waddled back out to our cars. KK and PK followed us back to our house, as they were still hauling our grill, ice chests and lawn chairs. We quickly unloaded the gear, said our goodbyes, and they were on their way home. I have lost track of how many trips we have been able to take with my parents the past five years, and I am thankful for these opportunities. Not just for me, but also for the kids that they get to spend this recreational time with their grandparents and my brother and sister-in-law. We had a great time!